This plant, with its very tall flowering spike, is commonly found along roadsides, and in fields. 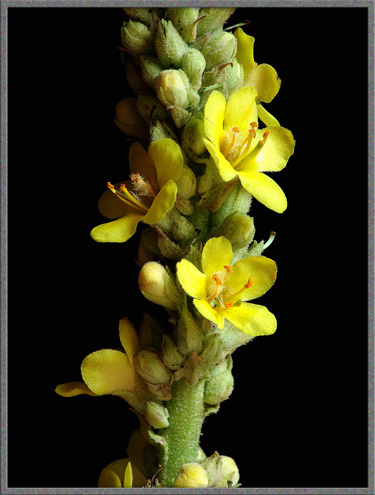 Mullein requires full sunlight in order to grow, and is not found in shady locations. The spike can be very long, sometimes reaching three metres above ground level. Able to withstand the worst extremes of Canadian weather, most stalks remain upright throughout the winter, projecting brown spikes up through the snow. It is believed that these stalks provide refuge in their deep crevices for over-wintering insects. Common Mullein leaves, which are oblong and stalkless, may be up to 40 centimetres long and 10 centimetres wide. They are densely hairy, and to the touch, feel like thick felt. In fact, all parts of the plant, including stem and flower petals share this soft texture. The dried down on leaves and stem was used historically as tinder, since it ignited with the smallest spark. Before cotton became the substance of choice for lamp wicks, dried folded Mullein leaves were used for this purpose. The old name “candlewick plant” originated from this application. 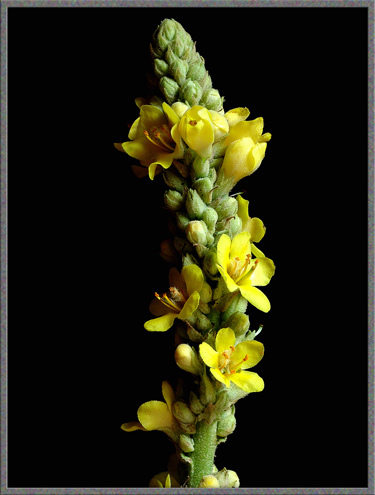 Mullein is the sole member of the Figwort family in the province where I live (Ontario). It is thought that the Latin genus name of the plant, Verbascum originated from a corruption of the word “barbascum” referring to “barba”, meaning beard. (The shaggy foliage was thought to resemble an unkempt beard.) The species name thapsus is thought to refer to the ancient Greek city of Thapsos. 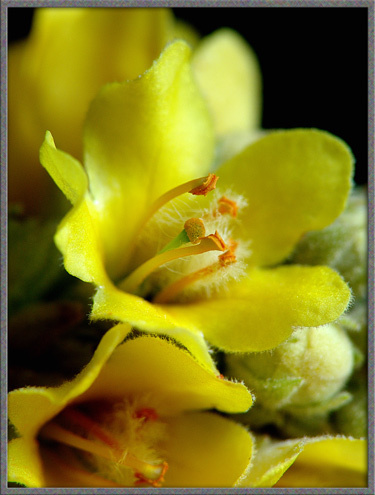 The plant has been given many common names over the years, including Flannel Mullein, Flannel Plant, Feltwort, Velvet Dock and Jupiter’s Staff. 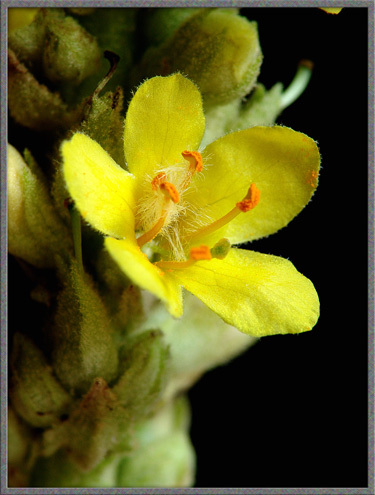 The first image in the article, and the two below, show a typical flower-head. These structures are usually from 20 to 40 centimetres long, and consist of a stem holding a profusion of buds and blooms on extremely short stalks. 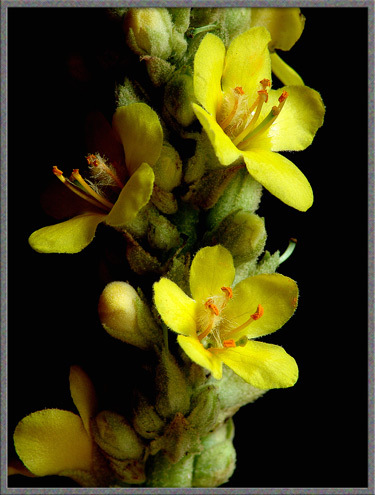 Unlike the flower-heads of many plants which bloom from bottom to top, or vice-versa, Mullein’s bloom in a completely random fashion, with only a few flowers being open at any one time. From a practical point of view, obtaining a specimen of this wildflower was particularly difficult. Although hundreds of plants grow near my home in the city, they are vastly outnumbered by the diesel-engined trucks on nearby roads, which spew fine black particulate carbon from their mufflers. 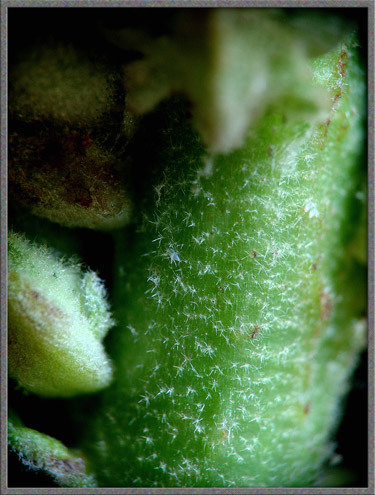 The felt-like surfaces of the plants soon become covered with this unsightly dust. (Do not, however, imagine that I dream of living in the unspoiled countryside, away from this pollution. The benefits of city life far outweigh the disadvantages - in my opinion!) Another problem that I found particularly vexing with this plant, has to do with the fact that all of my macro-photographs are taken inside under controlled conditions. 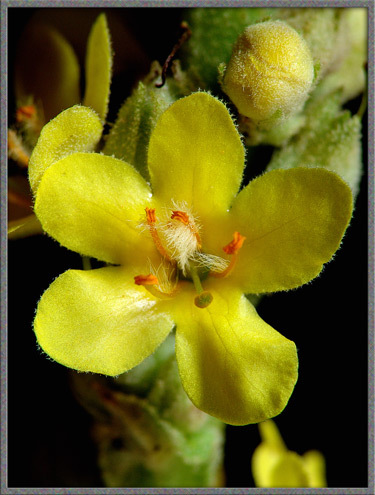 Unfortunately, Mullein plants usually harbour dozens of insects in the flower-head deep in crevices. Although I worked hard with probe and tweezers to remove as many as possible while still outdoors, some escaped my notice, and seemingly with great malice, tried to pop up in the field of view at the critical moment to have their photograph taken! 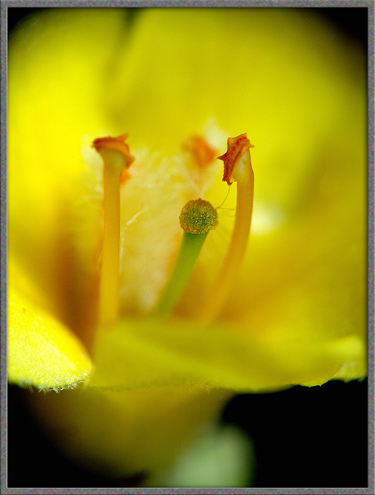 As can be seen below, each flower is composed of five yellow petals fused at the base. These petals are just as wooly or felt-like as the rest of the plant. 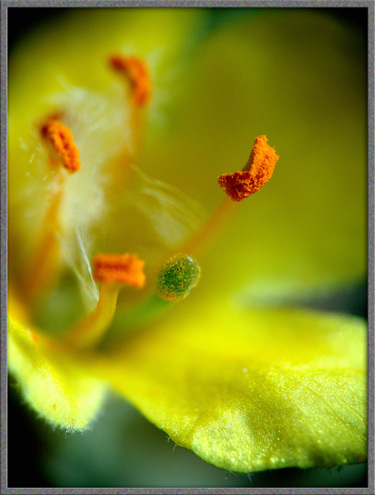 There are five orange anthers (the male pollen producing structures) supported by yellow-green filaments. A single bulbous green stigma (the female pollen accepting structure) is supported by a green style. Flowers tend to be from two to three centimetres in diameter. They bloom, a few at a time, over a period of about two months. 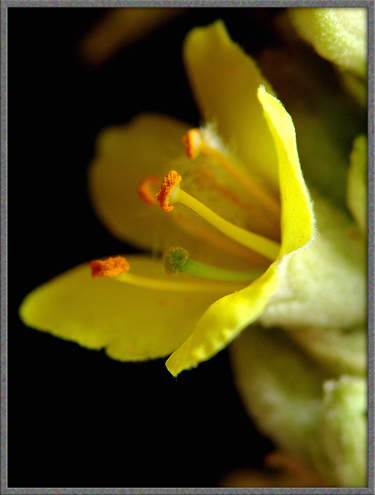 The three images below show close-ups of the reproductive structures - the five orange anthers and single green stigma. The following photograph shows several unopened buds, and one which is about to open. 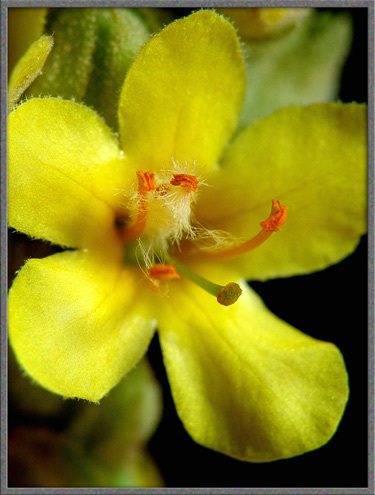 The flower’s petals are enclosed by hairy green bracts. One of these bracts is shown below at a higher magnification. 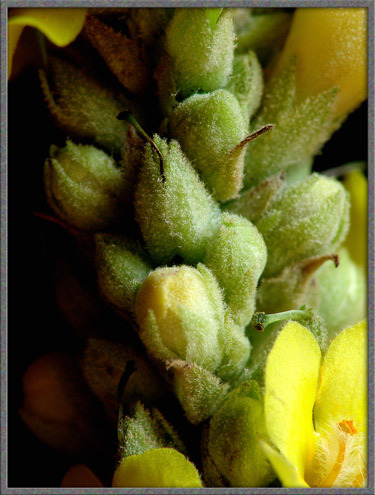 The green parts of the Mullein plant contain small amounts of the chemical compounds coumarin and rotenone. 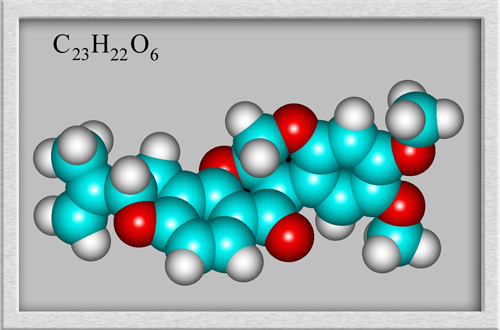 Coumarin derivatives, (such as warfarin), are used as anticoagulants to prevent undesirable clotting of the blood in patients suffering from heart disease. 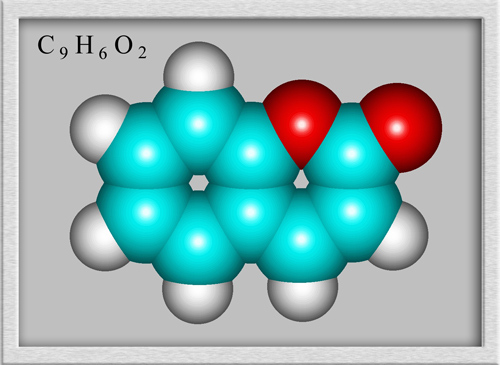 The molecular structure of coumarin is shown below. I mentioned earlier that the petals of the Mullein flower feel extremely soft to the touch - as though they were made from the softest felt. 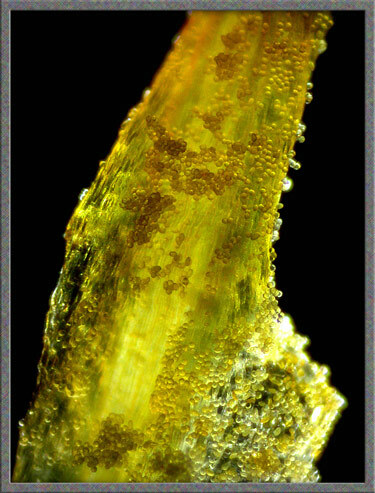 My experience with the microscopic examination of such structures led me to believe that the surfaces would be covered by a forest of dense hairs. How wrong I was! In reality, the petals are formed from very strange cells composed of a small spherical core with approximately eight long, sharply spiked projections. These cells are densely packed to form the petal’s structure, as can be seen in the low magnification photomicrograph that follows. Even though the cells appear tightly packed in the image above, higher magnification reveals that there is considerable empty space in the three-dimensional arrangement. The petal feels soft as you touch it because these spiked cells move closer together. When the pressure is released, the springy nature of the spikes tends to force the cells apart again - reinstating the original positions. What a unique and interesting way to produce a “soft” texture! 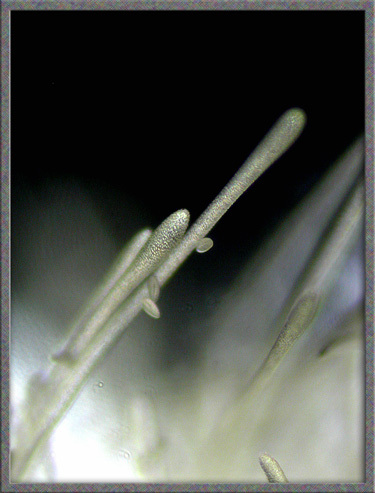 The photomicrograph below shows the base of one of the flower’s filaments. Notice the large number of pollen grains sticking to the surface. 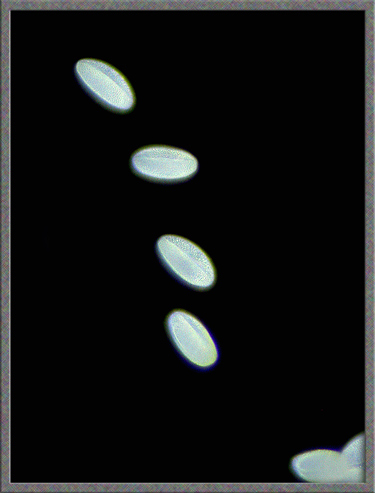 Pollen grains appear to be ellipsoidal in shape and have two longitudinal grooves. At the base of the style, there are many hair-like projections with rounded ends. 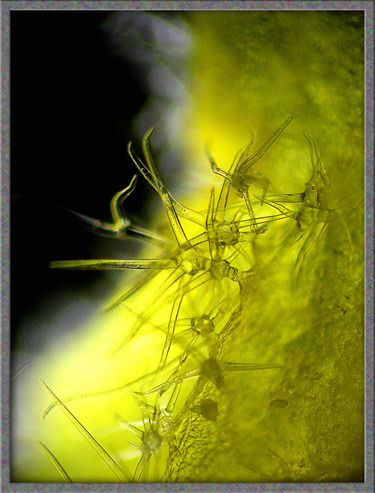 Several pollen grains can be seen clinging to the surface of one. 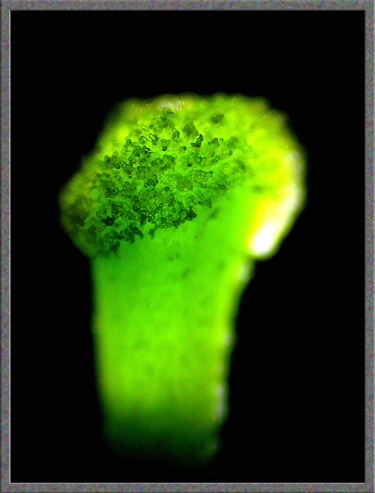 The final image shows the irregular surface of the stigma. A Common Mullein plant produces a huge number of seeds during the summer - up to 100, 000! These seeds, it is said, can survive for almost a hundred years, until conditions become favourable for their growth. It is no wonder then, that the striking yellow-green spears are so prevalent in the environment! The photographs in the article were taken with an eight megapixel Sony CyberShot DSC-F 828 equipped with achromatic close-up lenses (Nikon 5T, 6T, Sony VCL-M3358, and shorter focal length achromat) used singly or in combination. The lenses screw into the 58 mm filter threads of the camera lens. 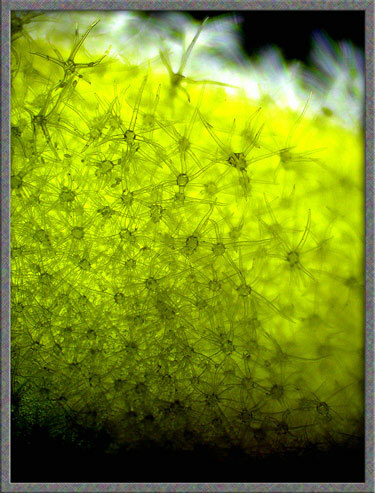 (These produce a magnification of from 0.5X to 10X for a 4x6 inch image.) Still higher magnifications were obtained by using a macro coupler (which has two male threads) to attach a reversed 50 mm focal length f 1.4 Olympus SLR lens to the F 828. (The magnification here is about 14X for a 4x6 inch image.) 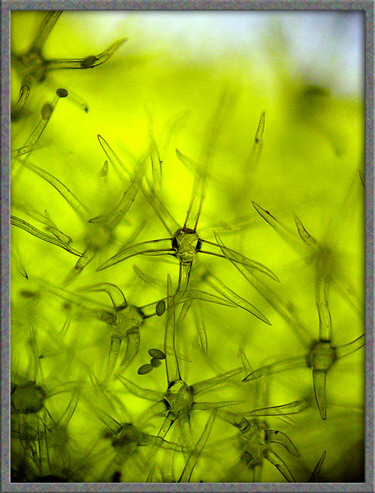 The photomicrographs were taken with a Leitz SM-Pol microscope (using a dark ground condenser), and the Coolpix 4500. The following references have been found to be valuable in the identification of wildflowers, and they are also a good source of information about them. Dickinson, Timothy, et al. 2004. The ROM Field Guide to Wildflowers of Ontario. Royal Ontario Museum & McClelland and Stewart Ltd, Toronto, Canada. Kershaw, Linda. 2002. Ontario Wildflowers. Lone Pine Publishing, Edmonton, Alberta,Canada. Royer, France and Dickinson, Richard. 1999. Weeds of Canada. University of Alberta Press and Lone Pine Publishing, Edmonton, Alberta, Canada. Crockett, Lawrence, J. 2003. A Field Guide to Weeds (Based on Wildly Successful Plants, 1977) Sterling Publishing Company, Inc. New York, NY. Mathews, Schuyler F. 2003. A Field Guide to Wildflowers (Adapted from Field Book of American Wildflowers, 1902), Sterling Publishing Company, Inc. New York, NY. Barker, Joan. 2004. The Encyclopedia of North American Wildflowers. Parragon Publishing, Bath, UK. Published in the February 2006 edition of Micscape. © Onview.net Ltd, Microscopy-UK, and all contributors 1996 onwards. All rights reserved. 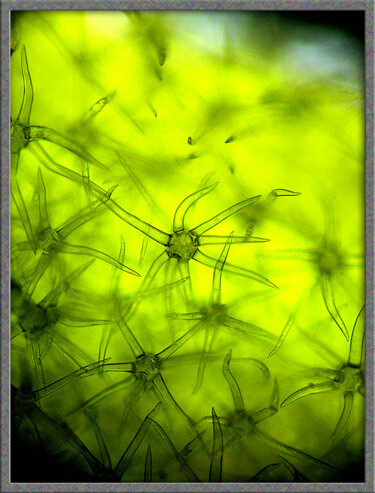 Main site is at www.microscopy-uk.org.uk with full mirror at www.microscopy-uk.net .